Travel Training is a free service of Intercity Transit that provides self-paced instruction to help passengers who can use regular bus service become familiar with local public transportation options. Our expert travel trainers teach people to travel independently, safely, and confidently. Trainees benefit immediately from the confidence they gain from learning to travel independently. Participants’ overall quality of life is also improved through increased independence, community involvement, access to employment opportunities and participation in recreational events. It supports an active lifestyle. It provides greater access to our community. It helps protect the environment. What does Travel Training teach? Read and understand route maps and schedules. Understand how to use our online trip planning tools. Get to and from bus stops. Pay fares and purchase passes. Identify, board and get off buses. Be safe and aware at bus stops, transfer points, transit centers and on buses. Maneuver a mobility device if needed. Know what to do in an emergency. Communicate your needs to the driver. What types of Travel Training do we offer? Our travel training services are customized to meet the needs of each passenger. Our goal is to ensure that passengers have the capabilities and confidence to use our bus service to its fullest extent. 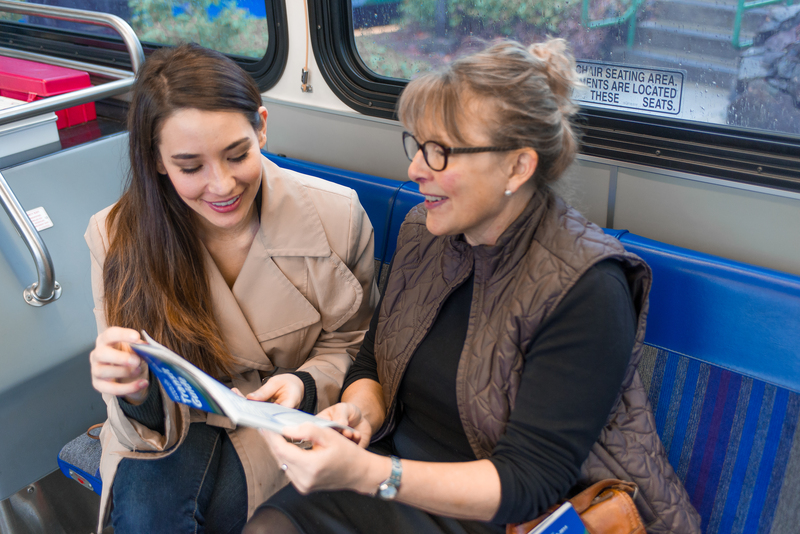 Intercity Transit travel trainers conduct comprehensive, one-on-one, instruction to specific destinations for passengers who need individualized attention. This training is conducted in the public transit environment—on the street, at transit stops, on buses, and at the times passengers will travel. Travel trainers use tools such as photo flip books, trip plans, and worksheets to create a truly customized program. Our one-on-one travel training uses a phase out method in which trainers shadow passengers and follow up with them at regular intervals to track their progress. This training provides general route demonstrations and familiarization. Travel trainers facilitate outings to community locations for real world experience. Classroom training includes a PowerPoint presentation and a “rolling classroom,” on a bus. These presentations are available to schools, senior living communities, public organizations and other community programs. Anyone whose trip starts or ends in Thurston County can use Travel Training! Email traveltraining@intercitytransit.com or call 360-705-5879.